Did you know that your selling privileges (on Etsy) can be suspended on May 18th, 2017 if you do not comply with the new Etsy Payments set up? It’s true and it was announced, in my opinion rather quietly, by Etsy quite some time ago. Now that the deadline is fasting approaching, I’ve had many sellers ask me my thoughts on this update. It’s important for me to offer an unbiased approach to evaluating any change on Etsy, or otherwise, which is why I wanted to breakdown what this really means for my fellow Etsy sellers. Let’s start with the basics. I already use Direct Checkout. Do I need to do anything? Nope! 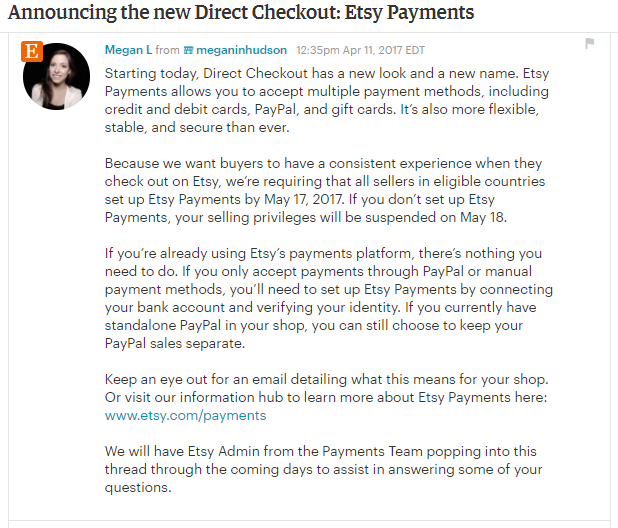 By having Direct Checkout enabled in your account, you’ll automatically be switched over to Etsy Payments. Nothing will change in regard to how you receive your deposits, unless you make those changes yourself. Keep in mind that you’ll be unable to turn off Etsy Payments after the May 17 cutoff. Will I need to use Etsy’s PayPal account or can I keep my PayPal sales separate? We recommend that you use our integrated PayPal offering so all of your sales go to your bank account no matter how your buyers pay, but you can choose to keep your PayPal sales separate and get paid to your personal, standalone PayPal account. Are there benefits to integrating my PayPal account? If a buyer pays with PayPal through Etsy Payments and files a case on Etsy, an Etsy employee will be able to mediate. PayPal will never have access to your funds or your payment account. As long as you follow the required guidelines, your funds and your account are covered by Etsy’s Seller Protection in the event of a dispute. When will I get my deposits? Etsy Payments offers you the ability to get paid out on a daily, weekly, biweekly (every other week), or monthly schedule. Funds generally take 3 to 5 business days to appear in your bank account, depending on your bank. If a deposit day happens to fall on a holiday, available funds will be sent on the next business day. I personally do not think this is a reason to panic or jump ship. If you already have integrated Direct Checkout, you don’t even need to do anything. Remember, when you choose to sell on a third party platform you are agreeing to their terms and conditions. There will always be updates and changes to their policies so this is just par for the course. So, what do you think? Are you a fan? Do you think this will improve the buying and selling experience or do you have some serious reservations? Thought I’d try Etsy 2017.had a sale recently.three day hold.then I received email funds being sent to my bank account,3-5 days.fifth day nothing.its Friday,so will my payment ever show.all my eBay payments went into PayPal?? Ebay and Etsy will be inherently different but if you are concerned your funds aren’t being properly deposited, I would absolutely contact Etsy Help so they could find out what’s happening for you. I find it quite refreshing to have my pymts deposited into my checking acct within a 36 hr. period, as opposed to PayPal, which has decided, after using them for 2 yrs, to start holding my funds for 21 DAYS!! 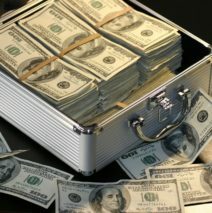 If anyone will take the time to read PayPal’s most recent Policy Changes,in it’s entirety, they inform us they will be making interest on our money! That’s very concerning and I would highly recommend reaching out to Etsy directly. I don’t like it, to many hacks on computers. I don’t like putting my bank account number on another site. Sorry, guess I am ole school. Not a fan. Etsy started as a unique, special kind of website with a user friendly platform. Now the site feels militant and unfriendly for sellers, constantly changing formats. If they want more sales, they should not try to strong arm sellers or hello…they’ll close shop or in this case, be suspended and “some” sellers will go elsewhere. Paypal is my preferred method of payment. It’s easy to handle business finances with their platform. Absolutely not giving personal information to another third party. Not setting up another bank account just for Etsy payments. Read about the problems with Etsy Payments deposits. Not a Fan Etsy will be suspending my account. I choose not to share my bank info online and I like to have my money instant. This was a great place to sell but I guess it is time to move on. I’m with you, Kenneth. When I saw the amount of what I consider to be sensitive personal information I had to provide Etsy to “comply” with their new policies, my immediate response was one of discomfort. My two shops have been suspended, but that’s okay. I have decided to leave Etsy. After selling online for 15 years (8 with Etsy) using PayPal exclusively, easily, and without problems, I am not liking the new payment platform. Do you mind sharing which platform you converted to? I am trying to decide looking at pros and cvons. Hmmm. Not really sure if this is what I want, we can use paypal, but it has to go thru etsy payments. I don’t like that.. I also print all of my shipping labels from paypal. I do all of my account in on paypal. I can’t decide if this is a great change or an awful one on Etsy’s part. I saw they extended the deadline to May 31, and that seems to be because so many people were hesitating to flip the switch and there were a lot of questions and concerns … I sort of suspect they didn’t want to have to suspend such a large percentage of shops, so they gave them more time. I really feel uncomfortable with the new set up. In this world to provide another site with all my account information does not feel right and safe at all. Etsy has a long history of “bugs” that either keep your money for longer than you agreed, or show your private info to everyone. They’ll not be getting more control over my work. I am not a fan of the new checkout. Many sellers use paypal funding as a source for a business oan to purchase new goods, cash flow etc. These loans are entirely based on your incoming paypal payments over 12 months . Now with funds going thru etsy this will greatly reduce paypal funds therefore cutting off this funding option for most sellers. This can be a life or death effect for many sellers who like myself use papal funding. Also I see etsy as dying website. From what I have found in research etsys “reach” has fallen 28% from one year ago today , 5/9. This info is updated daily on alexa.com. I am a longtime & top seller a(one of the top 300) of the millions of etsy sellers . I believe etsys next step to try to get revenue to to snip off supplies into a separate venue so they can charge sellers store subscription rates and higher fees as I am sure the small crafter won’t pay these. I started in 2008 and have seen the decline of etsy. It was a great place for unique items but now with an attempt to increase goods they have turned their head to mass made goods right off aliexpress. Also with their absurd search system is not user friendly with items chosen via etsys algorithms. Thanks for the reminder – I wasn’t sure of my settings but checked today and it looks like I’m already covered. I am definitely a fan of the Updated deposit options. It will be nice to have a daily payout without needing to request it every day.